Let us turn your existing design or innovative idea into a fully functioning application. No idea is too farfetched to us. We’ve heard them all. We are Pixel Pandas Interactive – an all-star team of developers, designers, data scientists, and creative minds. We specialize in web and mobile application design and development, but that’s just scratching the surface. 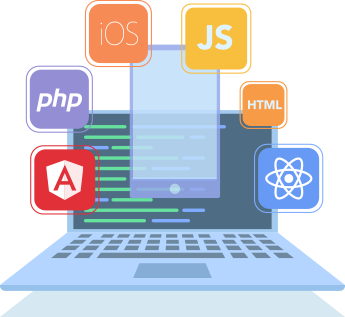 We can build anything from custom web applications, iOS & Android applications, custom WordPress themes, Magento e-commerce storefront templates, and more. We have a list of approved frameworks we work with here. Most importantly, we offer a decade of development expertise at freelancer prices. You tell us, or we’ll tell you. Do you already have a code repository somewhere like GitHub or Bitbucket? We are happy to pull down any existing project code and work with it, as long as it follows our coding standards. Have an existing API and need us to build the frontend? 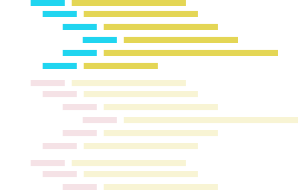 We will build a pixel-perfect UI. Need architectural advice? We can help you create a data model and wireframes. Use us for whatever you need help with! Need an application with a CMS? No problem. We can create a custom one specifically catered to your app. 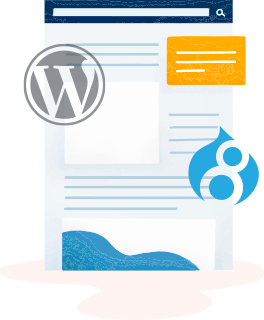 We love WordPress, and we certainly don’t mind Drupal 8 either. Both are very capable frameworks that can enable us to have your website up and running quickly. We can also go with the “start from scratch” approach if you are looking for a custom CMS rather than one of the off-the-shelf options. Once again – you tell us! 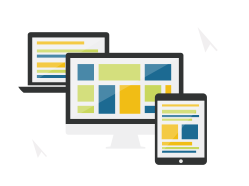 We don’t discriminate against any device or browser! (Well, we’re not huge fans of Internet Explorer, but who is?). Your design will be coded using Bootstrap 4’s responsive flex-box grid system to work on iPhone, Android, iPad, desktop, and any other device that isn’t from the stone age. But don’t worry, we do have polyfill support for those older browsers who can’t keep up. We aren’t a chop shop. We don’t hack things together to make them work. We use the latest and greatest technologies to build your application. No heavy “plugins” weighing your website down, and when we do install npm dependencies, we ensure they are production-ready, lightweight packages. We also use linting libraries like ESLint to ensure there are no unused variables, no unnecessary imports and ultimately, no extraneous code. Track your project with us. That’s right. We use Timeneye for all of our projects – big or small. It allows us to provide a to-the-second accurate summary of project hours. We group them into categories of planning, design, development, QA testing, and deployment tasks.